No? Well you can probably guess a couple of things about it at least – that it’s near Niagara Falls, and that it’s on the shores of a lake! That’s all I knew too, but last autumn I visited for myself, and discovered a lot more. What I came away with, as well as an appreciation of the warmth of the local population and the beauty of the landscape, was some serious envy about the quality and variety of fresh produce grown here. 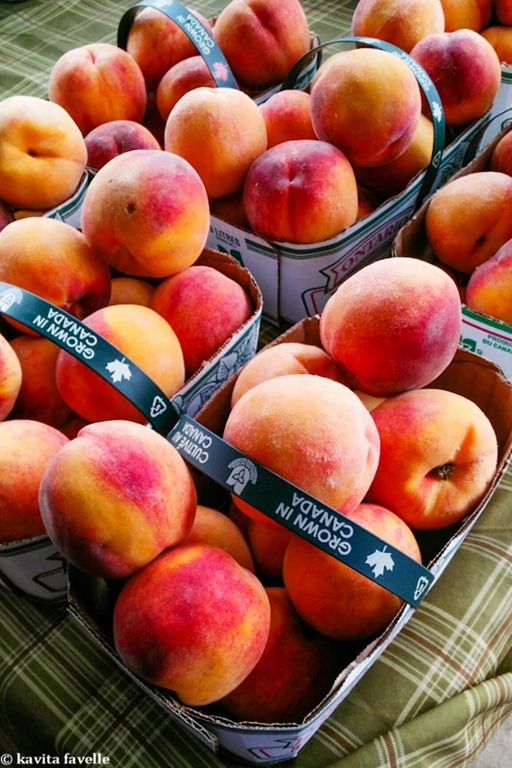 Readily available directly from the farm, at farmers markets and in local stores, it’s put to fantastic use by local producers, restaurateurs and home chefs. Very much a farming community, many of the farms have a farmgate shop – exactly what it sounds like, a shop or stall from which farmers sell direct to their customers just yards from where the produce is grown. 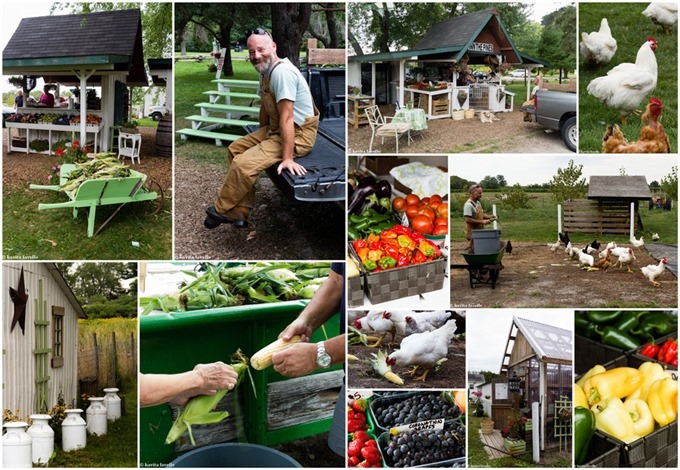 We stopped at Inn the Pines in St. Catharines to admire their produce, watch happily squawking chickens enjoy freshly harvested corn on the cob, and chat to owners Cheryl and Barney Barnes – that’s Barney posing on the back of his pickup and feeding the chooks. As we learned a little about some of the produce they grow and sell to both restaurateurs and home cooks, an elderly couple arrived to buy corn by the barrow-load, deftly peeling away the husks which will no doubt be thrown onto a nearby compost heap and bemused by my request to take a photo. There’s something rather special about buying produce direct from the farmers; one of the things I can’t help but envy, as a London-based city slicker. Whitty Farms is another local farm just outside St. Catharines, and like Inn the Pines, has been handed down through the generations. Today, it’s the turn of Doug and Karen Whitty, and just like Inn the Pines, customers can buy direct from the farm. But there’s another treat not to be missed alongside all the fresh produce and that’s the output of 13th Street Bakery. Their butter tart may be a contender for best in Niagara, if not all of Ontario or indeed the entirety of Canada; if anyone is looking for someone to do a more comprehensive survey, point me at the application form right now! Butter Tarts are a much-loved treat across Canada and there’s hot debate on just what a good butter tart should (and shouldn’t) be. A basic butter tart has a filling of butter, sugar, syrup and egg baked in a flaky pastry casing, often with the addition of Canadian maple syrup. Purists eschew the addition of pecan nuts or raisins, let alone anything more exotic . It’s less clear cut whether ‘traditional’ allows for a firmer or softer filling but the ongoing argument is a good excuse to taste as many examples as possible. The Whittys, with their friends John and June Mann also set up 13th Street Winery at the same site, more of which in an upcoming post. 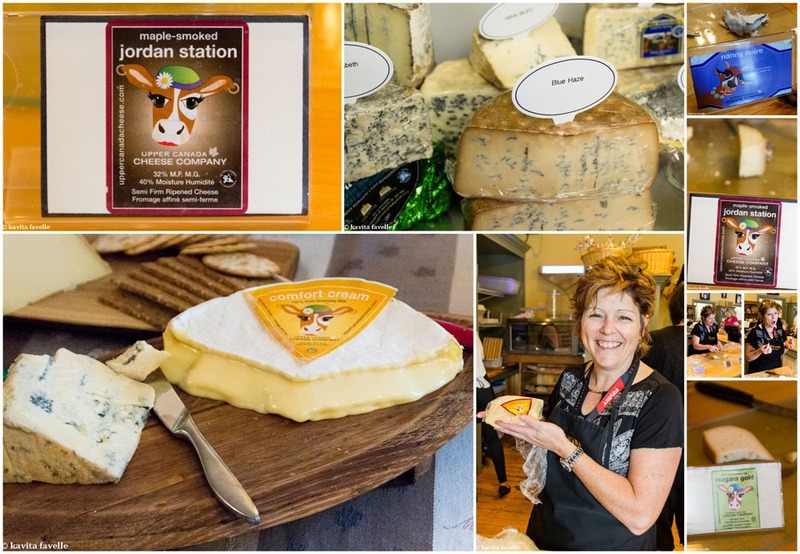 Another favourite stop for me as a cheese addict, Upper Canada Cheese Company in Jordan Station is a small local creamery producing a range of cheeses from the milk of local Guernsey cows and goats. We tried a selection including Niagara Gold, a semi-firm washed-rind based on traditional Loire Valley cheeses, Comfort Cream, a camembert-style soft bloomed rind cheese which is best when super ripe, the maple-smoked version of Jordan Station, another semi-firm cheese and Nanny Noir, a goats milk camembert-style cheese rolled in vegetable ash and allowed to ripen for four weeks. We also tried an experimental new blue cheese – great flavour but some more work needed on the texture. This is everything you want of a cheese shop – great cheeses and very helpful staff happy to give tasters and help every customer find just the cheese (or cheeses) they need. But I was still keen as maple-mustard to visit White Meadows Farms and sample their four grades of maple syrup, and to taste their range of maple syrup products – sauces and mustards, vinegars and salad dressings, maple sugar and maple butter (maple syrup boiled until it’s dry and whipped into a spreadable form, respectively), fruit and maple jams, and of course, traditional maple candies. Maple syrup, made from sap collected from maple trees, is graded by colour into Light, Medium, Amber and Dark. Canadian maple syrup must be 100% maple sap, and the finished product must have a sugar level of 66%, achieved by boiling natural sap to evaporate the water content which thickens the consistency and concentrates the sugars. The boiled syrup is then filtered before being packaged for sale. The colour is governed by the sap, with early season sap usually producing the lightest finished syrup. Dark is harder to find, as it’s produced right at the end of the season when the sap is at its richest and the strong flavour is not to everyone’s taste. Dark proved to my favourite, and I bought a few bottles to bring home. 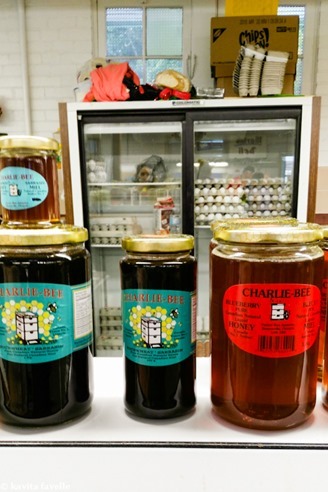 The best thing about the market, aside from the top quality produce itself, were the very friendly stall holders, keen to tell us about their goods and to welcome us to their town. The market consists of two main buildings dating from 1919, and some outdoor marquees as well. Alongside fruits and vegetables you can find fresh meat and eggs, charcuterie, local honeys, fresh baked goods, cheese, chocolates, flowers and wine. 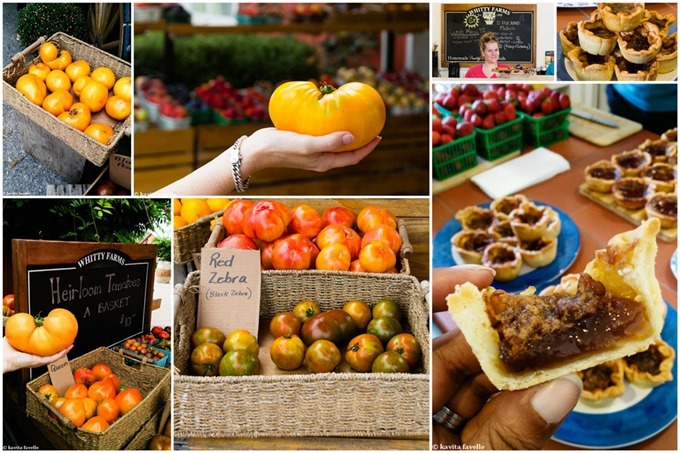 Kavey Eats visited Ontario as a guest of Destinations Canada. With additional thanks to Anna and Michael Olson for being our hosts, and Diane Helinski for being our tour manager and guide. 20 Comments to "Markets of Canada | Niagara-on-the-Lake"
I have been to Niagara Falls, but we didn’t get to go here. I wish we had of done though, as all the produce looks amazing. I would have wanted to stay somewhere with a kitchen to cook with it all. It really is. We were staying in a hotel but we visited Anna and Michael Olson in their home for a dinner and a breakfast, and got thoroughly involved in the cooking, under their guidance. Plus a cooking challenge they set us, which I’m sharing in an upcoming post. I really was so envious of all the great produce. 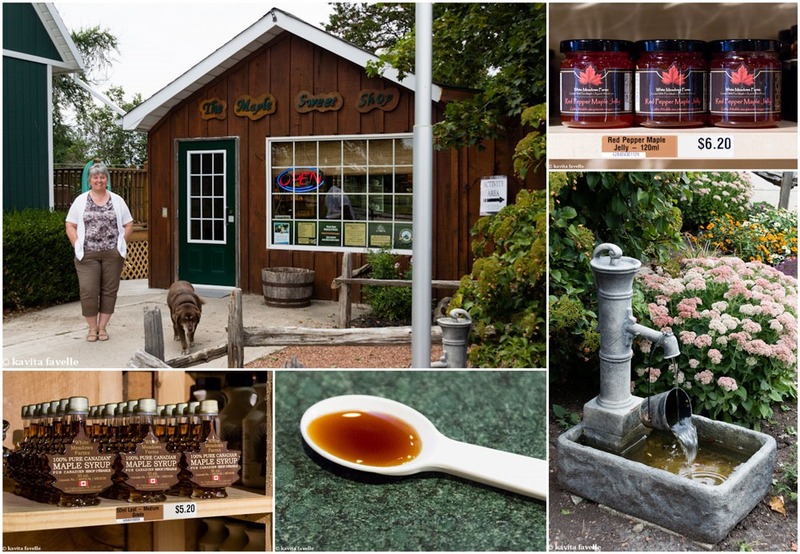 I really, reall, really, want to visit a maple farm. Honestly on my to do list. Plus I am still drooling of your trip pics and sending them to the OH with a lot of strong hints. I visited at the wrong time of year to witness the harvesting of maple sap but I did still get to see a sugar shack up near Quebec City, and popped into a number of specialist maple syrup stores. This was lovely because we were buying direct from the producer. Yes, such a great food culture, a much more foodie destination that I’d realised before investigating and visiting. I’ve never visited Canada, and I definitley would one day. 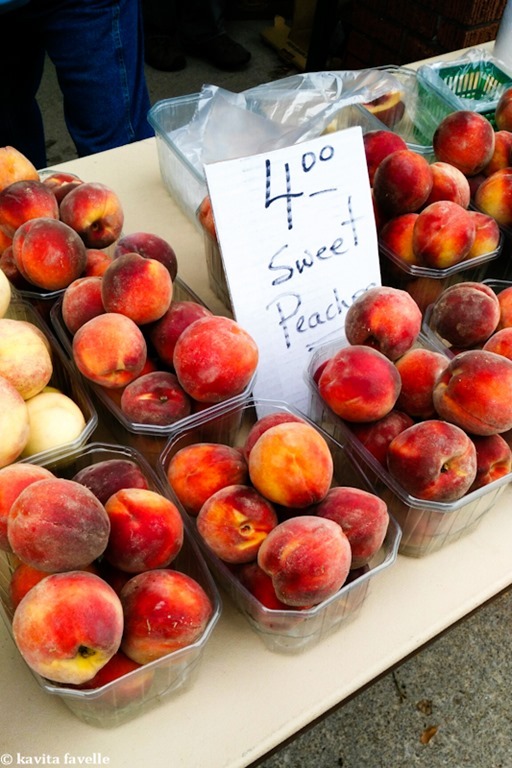 Love the idea of exploring a country through its food and farmers markets are a great place to start. Those Heirloom tomatoes!!! Yes, it’s such a wonderful way to explore, we love to learn about a place through its food and drink. What a fab place! I love visiting small retailers and producers like this, they’re always so passionate about their products. Yes, it’s so inspiring to chat to them and learn about what they do, and their produce. Such a fun farm! I wish I could grab those apples from here! No apples, Priya, those are all peaches, but yes, lovely markets and farm shops. I know, one absolutely could not ask for a better and more professional hand model. I need to send you the photo of you and the Inn the Pines cat! Loved their butter tarts so much! I love places like this. When we were in Denmark a few years ago there were many farmgate shop that worked on the honesty box basis. It was such an amazing experience. This place looks wonderful and wish we had more of these here in Germany too. Yes, some of the smaller farmgate stalls I saw when driving around the Île d’Orléans (just off the coast of Quebec City) were not manned all the time and had honesty boxes left out for payment. 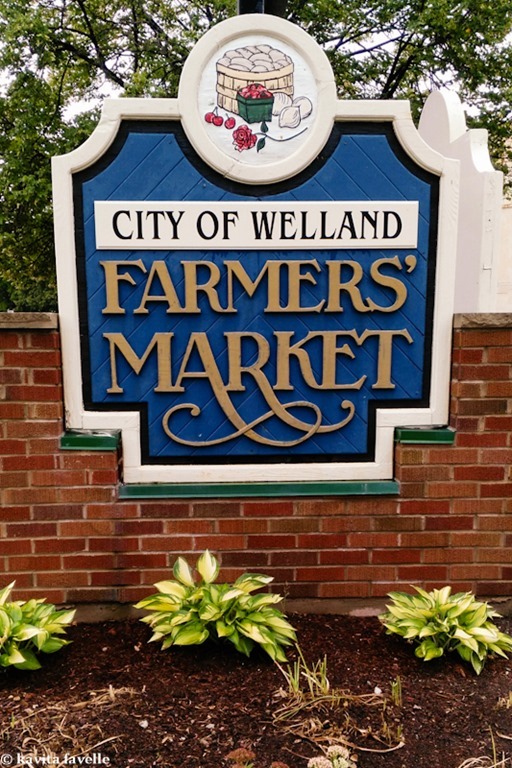 Wish we had something like Welland Farms Market in our area! Looks like an amazing trip. Me too! 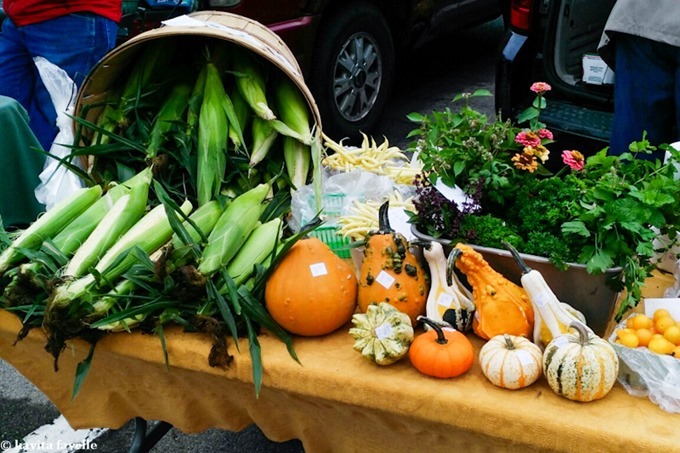 We do have farmers markets but it’s often a real mix of genuine farmers and opportunistic middle men. I really love that it’s so easy to buy directly from the farmer here, and they really know their produce too. I’m not keen on hot, lay-on-the-beach holidays either. I can’t tolerate the heat very well and I get bored too. I’m so glad to read that my post has given you a yearning to visit this area, I can’t imagine that anyone who loves fresh produce as you do would be disappointed in the food and food culture of this region, let alone the wonderful restaurants, cafes, and friendly people!